You've got to accept what is the truth. Dave Parker and Lou Brock were some pretty slick dudes back in their playing days on the Pittsburgh Pirates and St. Louis Cardinals, respectively. To be fair, Andrew McCutchen and Yadier Molina add some swagger to the current iteration of these teams; plus, they are in tremendous physical shape compared to the most of the players from Parker and Brock's generation. I nevertheless have a soft spot in my heart for guys like Parker and Brock who exemplified an era of players who played hard on the field and by looking at these photos, you can tell they probably played hard off the field as well! 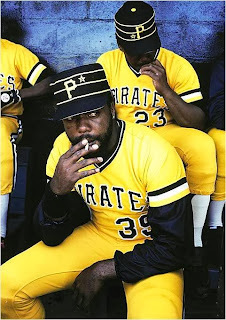 I dug up these photos of Parker and Brock because they are shown wearing the controversial pillbox caps of the mid to late 1970's. 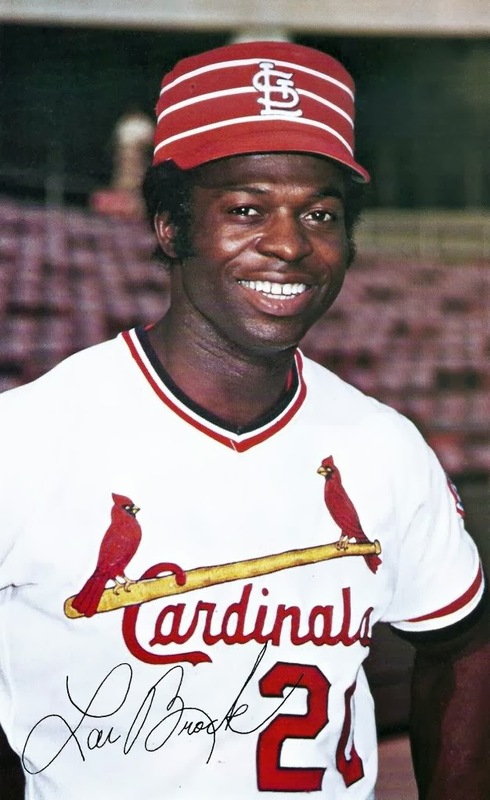 While the Cardinals are generally considered to be one of the most storied franchises in baseball, the Pirates haven't had much success in recent years until this season. As my obsession is fitted caps I would correlate their misfortune to them ditching those sweet pillbox caps in the mid-1980's, though my Giants-bias leads me to believe that Barry Bonds signing with the Giants in 1993 could have attributed to some sort of curse there as well. I suppose neither claim has any real grounds but I'm happy in my delusional world thankyouverymuch. This year was a different story for the Pirates as they had a breakout season shedding themselves of a losing streak that lasted 20 years. 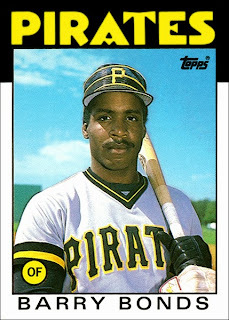 Even though the Pirates fell in Game 5 of the recent ALDS, I admired their tenacity all season long. I was pulling for the Pirates in that series because as a Giants fan, I feel that the Cardinals have more success than I'm comfortable with accepting. Now I guess whoever can beat the Dodgers is the team that I'll support, even though I would ultimately prefer that the Cardinals not notch another pennant or World Series championship! After the Giants counted themselves out of a repeat championship season I sort of got wrapped up in Bucco fever. 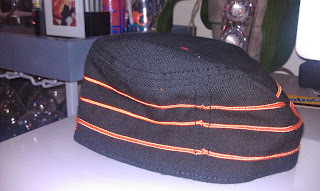 I even got a bit nostalgic when I rediscovered this pillbox cap that was produced by Upper Playground. I picked this hat up back in 2011 during a visit to San Francisco but I've rarely worn it because it draws a little bit too much attention. 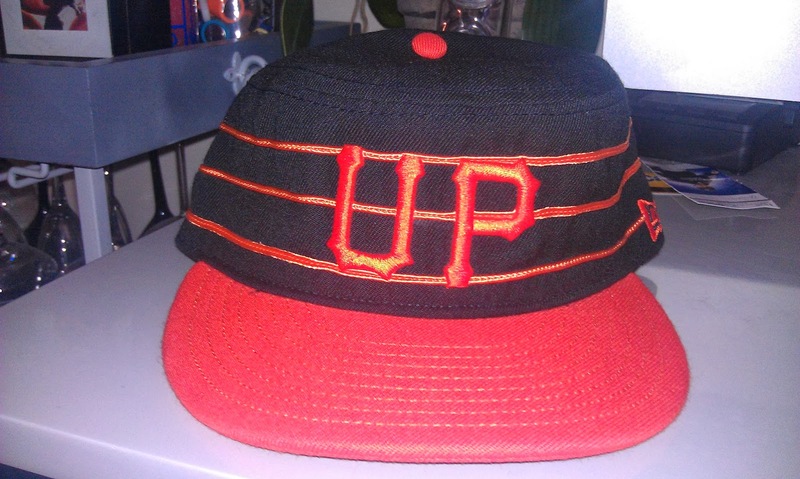 So even though it's not thre freshest of all fitteds, it was all but forgotten so I figured I'd bust it out in respect of what the Pirates accomplished this season. This hat is nicely done up in the classic San Francisco Giants orange and black colorway. The lettering features the serifs that the Giants are famous for using, though admittedly the Pirates have used serifs long before the Giants ever played in San Francisco. I particularly enjoy the Upper Playground tag (placed to the left of the New Era tag) because I associate the UP logo with so many fond memories that I have from my days living in the Bay Area. Sadly enough, I've seen more than my share of reproduction pillbox caps that inexplicably have the MLB batterman logo on the rear of the cap. 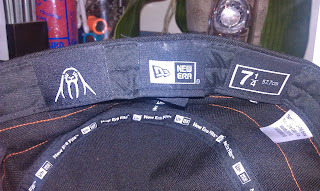 Thankfully the authentic retro feel of this cap is intact as there is no attempt to mimic that trend. In a season when my team left me a little disappointed, maybe a baseball cap that isn't a baseball cap is exactly what I need. 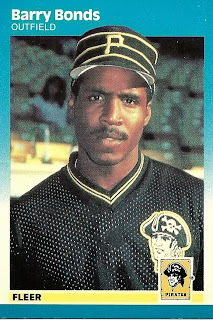 Jaust to fit in with the pillbox theme, here are some photos of an awkward twenty-something Barry Bonds rocking the cap on his 1987 Fleer card and his 1986 Topps Traded rookie card.